Halloween or Hallowe’en is now celebrated across the world on the night of 31st October. A special time of the year when many believe that the veil between our world and the spirit world is at its thinnest, where spirits can make contact with the physical world, a night when magic is at its most potent. Modern day celebrations generally involve groups of children dressed in scary costumes roaming from house to house, demanding “trick-or-treat”. Fearing the worst, intimidated householders normally hand over vast amounts of treats in the form of chocolates, sweets and candy to avoid whatever dastardly tricks may have been dreamt up by these little scoundrels. The origins of these celebrations however date back thousands of years, to pagan times. Until 2,000 years ago, the Celts lived across the lands we now know as Britain, Ireland and Northern France. Essentially populated by farming and agricultural people, the Pre-Christian Celtic year was determined by the growing seasons and Samhain marked the end of summer and the harvest and the beginning of the dark cold winter. The festival literally symbolised the boundary between the world of the living and the world of the dead. November 1st was considered the end of the summer, and the start of the month of death in the Celtic calendar, the date on which the herds were returned from pasture and animals were slaughtered to provide meat for winter. Indeed, the Modern Welsh for November Tachwedd literally means ‘The Month of Slaughter’. It was believed by the Celts that on the night of 31st October, ghosts of their dead would revisit the mortal world and large bonfires were lit in each village in order to ward off any evil spirits that may also be at large. Celtic priests, known as Druids, would have led the Samhain celebrations. 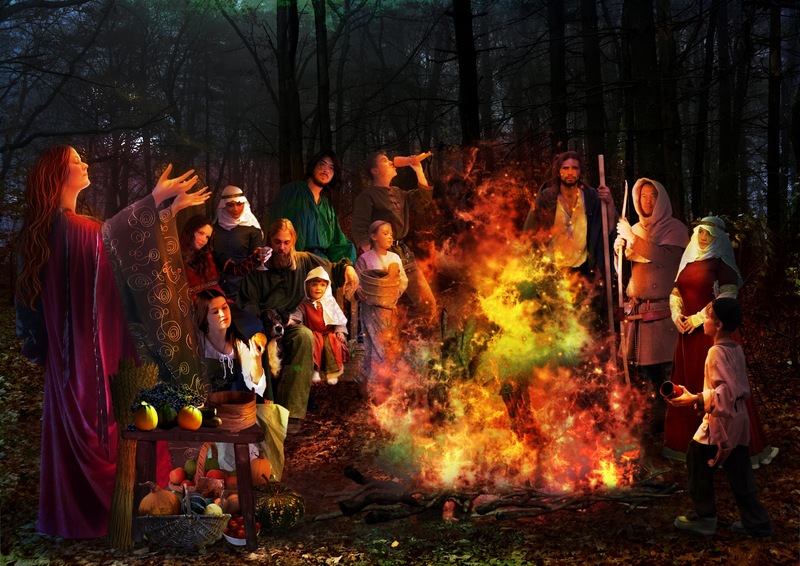 It would also have been the Druids who ensured that the hearth fire of each house was re-lit from the glowing embers of the sacred bonfire, in order to help protect the people and keep them warm through the forthcoming long, dark winter months. Carved pumpkin Jack O lanterns were in fact originally made from turnips and lit to guide the dead back to earth, and the Celts also dressed in costumes much as we do today, but they would have worn animal skins, masks and other disguises to avoid being recognized by the ghosts thought to be present. It was in these ways that beings such as witches, hobgoblins, fairies, and demons came to be associated with the day. The period was also thought to be advantageous for foretelling on matters such as marriage, health, and death. On tradition observed was once the bonfire had been lighted, each member of the family would throw into the blazing heap a white stone containing some mark or cabalistic sign. Next morning, among the charred ashes these stones are sought for, and if by any chance one of them has disappeared, it is believed that the luckless thrower will never see another All Saints’ Day. In the decades that followed, Britain was invaded by a new religion. Christianity arrived bringing the Christian Festivals and amongst them “All Hallows’ Day”, also known as “All Saints Day”, a day to remember those who had died for their beliefs, but this was in fact originally celebrated on 13th May. Pope Gregory had the date of the All Hallows’ feast moved to 1st November sometime in the 8th century. He announced that Christian missionaries were to convert pagans to the Christian religion and where possible, incorporate the beliefs, festivals and sacred sites of pagan beliefs into the Christian religion. It is thought that in doing so, he was attempting to replace or assimilate the Celtic Samhain festival of the dead with a similar “church approved” celebration. In the eleventh century, a further festival was added to the church calendar; All Souls Day on 2 November. The three festivals of All-Hallows Eve, All Saints and All Souls were together known as Hallowmas. Despite the Church’s success in establishing a Christian basis for the autumn celebrations, many of the ancient customs and traditions associated with them were still practiced by the population. The carving of gourds and the wearing of costumes and masks to scare away malevolent spirits are typical of the superstitions carried over from these celebrations into the All Hallows Eve. The custom of “trick-or-treating” has its origins in a ritual wherein the elders of a village or town would go from house to house and receive offerings of food and gifts for the souls of dead friends and relatives thought to visit on this night. This practice evolved during the Middle Ages, when beggars would travel from village to village and beg for “soul cakes”. Villagers would offer prayers along with the cakes to those who had died in the past year for their transition to heaven. Fire sticks and torches clearly anticipated the Guy Fawkes revels on the 5th of November and naturally lead to bonfires, which had a grimmer significance on the eve of All Saints’ Day. Queen Mab is a fairy referred to in Shakespeare’s play Romeo and Juliet, where “she is the fairies’ midwife, described as a miniature creature who performs midnight pranks upon sleepers, sometimes relieving desires but sometimes leaving nasty blisters on the lips should she so choose. This is why fire sticks were among the commonest asset of a well-considered Halloween. The same use was to be found in the scarlet -berries of the rowan tree or mountain ash, and in a coil of scarlet wool. They say in Scotland, “Rowan tree and red thread. To gar the witches and dance them dead,” which, being interpreted, means to dance down until they die from exhaustion. Variations of these bonfire ceremonies were observed in all parts of the country. The love ceremonies in connection with Halloween are almost as numerous as those connected with St. Valentine’s Day, and apples as well as nuts play a curious part in the accurate adjustment of the destinies of the young people. To burn two nuts side by side in order to see if the flame is mutual, steadfast, and enduring, or sudden, fitful, and impetuous, was common as was the old trick of flinging orange or apple peel over the shoulder to see what initial it would form. Many young women also believed that if they took a candle and stood in front of a mirror, where she had to eat an apple before it and comb her hair. If lucky, she will see the face of her future husband peeping over her shoulder. This Halloween, Abergavenny will see many celebrations going on across town, many of them, sadly now Americanized and not at all sympathetic to our Celtic roots. But whatever your method of celebration or even if your choice is to abstain, I hope we can respect that this is a historical and fascinating custom that we are keeping alive in 2016, so enjoy your evening and stay safe! Previous post: ​The Moon’s Effect- Does A Full Moon Have An Effect On Paranormal Activity?